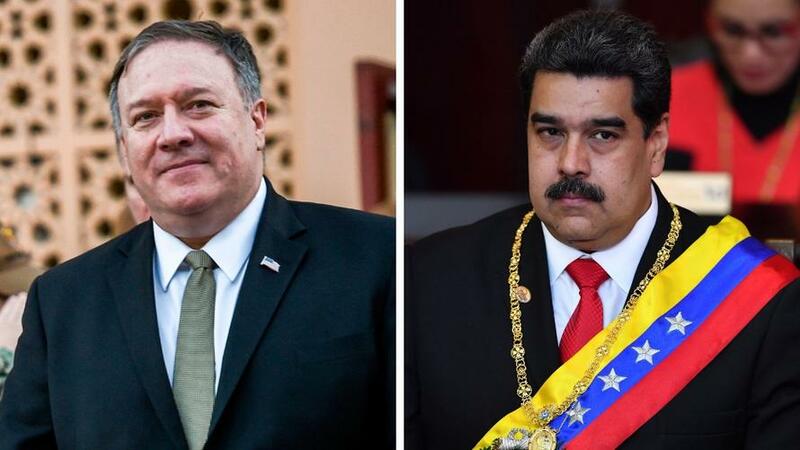 In some of the most unrestrained comments expressing future administration plans for the Maduro regime to date, Pompeo said the US would work with allied partners to restore democracy there. His words followed on a previous State Department statement from earlier in the day expressing US support to the head Venezuela's opposition-run congress, Juan Guaido, a day after he expressed willingness to step into the presidency temporarily to replace Maduro. "The people of Venezuela deserve to live in freedom in a democratic society governed by the rule of law," State Department spokesman Robert Palladino said. The official statement, also released from Abu Dhabi during Pompeo's trip, continued the Washington theme which spans multiple administrations of "orderly transition" in Caracas: "It is time to begin the orderly transition to a new government. We support the National Assembly's call for all Venezuelans to work together, peacefully, to restore constitutional government and build a better future." "The United States government will continue to use the full weight of US economic and diplomatic power to press for the restoration of democracy in Venezuela," the State Dept. said. This comes after days ago Vice President Pence wrote earlier this took to Twitter to slam the "sham" election that had led Maduro to a second term: "The US does not recognize the illegitimate result of a stolen election," Pence tweeted. "We'll continue to stand with the people of Venezuela and against Maduro’s corrupt regime until freedom and democracy prevail in Venezuela!" However, given that the socialist country has already fallen deep into a perfect storm of starvation, disease, a lack of healthcare, extreme violence, and infrastructure collapse, the usual Washington playbook of "more rounds of sanctions" and calls for regime change to "restore democracy" will most likely only fail. From Iraq to Iran to Syria to Libya — or beyond that other comparisons from the 20th century — the historical record shows sanctions and political "isolation" only increases the people's dependence on the regime, in many ways strengthening its grip of power, while compounding the misery of the masses. The regime can then legitimately claim a destabilizing foreign power is subverting the country's independence, resulting in "blowback" for the US and its policy planners.